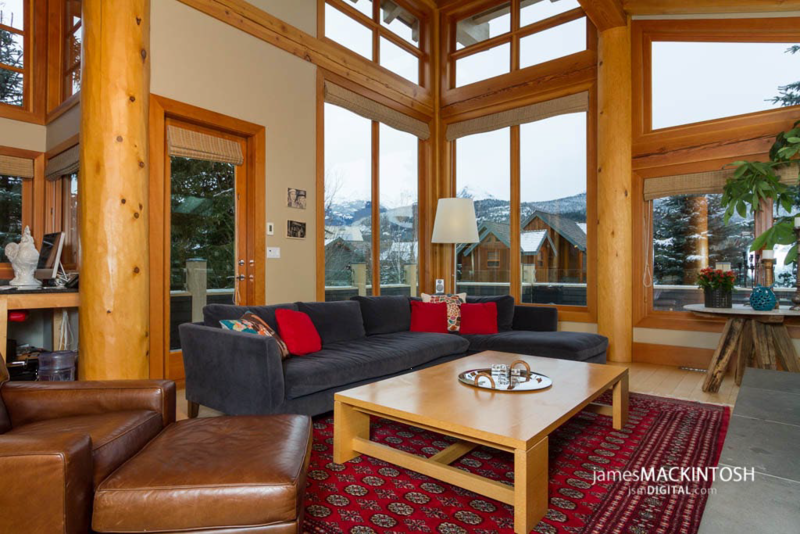 Sunshine Inn is a Whistler Luxury Holiday Home with 3100 sq.ft. of living space. It is located on the 1st green of the Prestigious Nicklaus North Golf Course. A well designed home with 5 bedrooms and 4 full baths. 3 TV living rooms; a large main living room with high cathedral ceiling and fireplace, a lofted TV room with games and video’s, and a TV den with VCR at the back of the home. A large central rock fireplace in the living room, gourmet open style kitchen with cooking island and counter seating, double garage, perfect home for multi family use. Home is great for group events when booked with other Whistler Home Holidays homes. The Sunshine Inn Whistler Holiday Home entrance is either from the front door to entrance foyer, or through the double garage into the boot storage/laundry room. Both entrances open up to the large open gourmet kitchen/living/dining room with the central rock fireplace. The custom-made dining table set has seating for 10 guests. Patio doors on either side of this large room open to the patio deck with BBQ, private hot tub AND a large lawn for children and group events. (One of only a few Estates with full lawn space) Excellent for large group functions. Bedroom 1 with 2 Twins – King, is on this main floor with a full shower bathroom across the hall (individuals with limited mobility will find this bedroom/bath desirable) completing this main open floor are laundry facilities in the back by the garage, computer desk with DSL Internet, Data port and Wireless access. The Large open kitchen has an island for food prep/buffets and 2 counter-seating areas for 5 more guests. An open wood staircase in the center of the living room is for the 2nd floor access. The stairs end in a lofted TV room with lots of seating, DVD/VCR/ and Nintendo, the open hallway with banister railings overlooks the living room offering spacious views for more group dynamics. Off this open hallway are all the bedrooms. Bedroom 2 just at the top of the stairs, Twin to King feature, Bedroom 3 next door with 2 Twins, next room is a shared bath. The largest bedroom (4) and bath is located at the end of the banister hall, with King bed, en-suite bath with Jacuzzi tub, private balcony and TV/DVD/VCR. The 5th bedroom is at the end of the second hall and has a Double bed with Twin top bunk and a private bath and TV room.